Rated 3.7 out of 5 stars.14 total votes. Let your little scholar sit back and study in style with this child-sized desk chair. Crafted with a metal frame finished in silver, this piece features a round padded seat and heart-shaped back that are wrapped in bright upholstery for a splash of color. Thanks to this design’s folding frame, you can easily store this seat or move it to a corner when your tyke would rather run around than read or work on crafts. Viv + Rae brings you affordable furnishings for kids of all ages. On-trend, colorful styles grounded in classic appeal make a statement, even in the smallest settings. 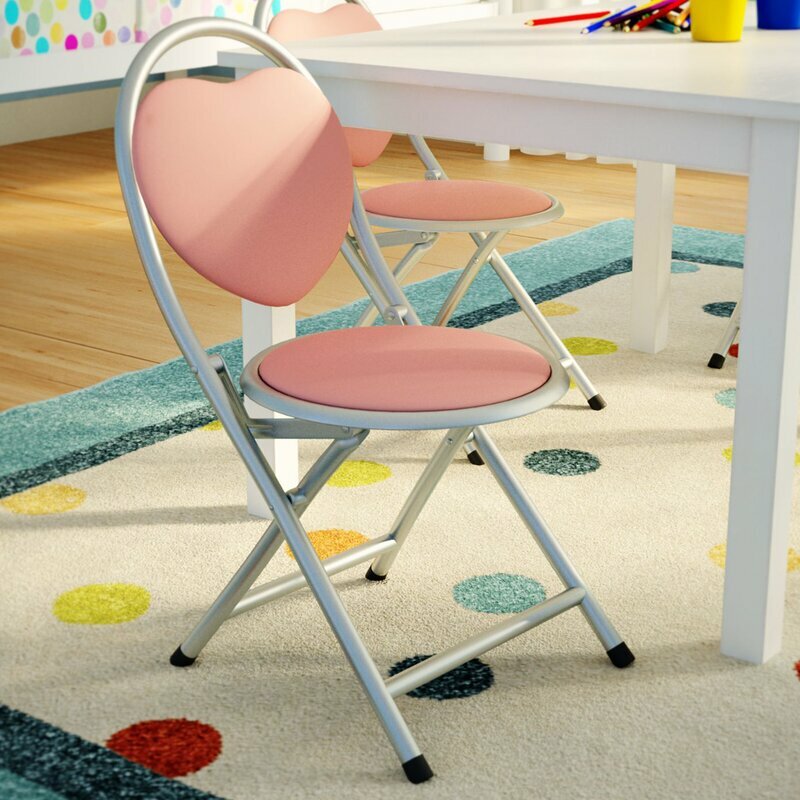 When you buy a Viv + Rae Metal Folding Kids Desk Chair online from Wayfair, we make it as easy as possible for you to find out when your product will be delivered. Read customer reviews and common Questions and Answers for Viv + Rae Part #: VVRO1104 on this page. If you have any questions about your purchase or any other product for sale, our customer service representatives are available to help. Whether you just want to buy a Viv + Rae Metal Folding Kids Desk Chair or shop for your entire home, Wayfair has a zillion things home. Rated 2 out of 5 stars. As you can see from picture, this is NOT a “child’s desk chair.” Very disappointed. Made well but so tiny grandkids can’t sit on it. It is 17” high when opened. Quality good but product description and picture advertised is very misleading. Wish I had read the reviews. This chair is NOT a desk chair. It is cute and well made but I needed a desk chair. This chair is certainly not for a child the picture is deceiving. We bought this for my daughter (4 yo) for Christmas for her desk and she thought it was an accessory for her dolls. Really great quality chair but it is SMALL! Daughter absolutely loves it anyways!! I was so disappointed with this purchase. I bought it for my daughter who has been wanting a chair for her vanity. When it came in it was like a tiny circus chair. A baby doll could fit in the chair. I guess I should have read the dimensions but still it was pricey for a small chair like that! My grandkids love these chairs. They are cute and easy to handle and they can move them around to wherever they want to sit easily. From a day at the beach to backyard barbecues and, of course, tea parties, this folding chair gives your little one a spot to rest their feet. Crafted from resin, it boasts a lightweight, portable design that folds up and stacks for easy transportation and storage. What’s more, it sports a Shaker-style seatback that, we think, is worthy of any big kids’ table. Its UV-stabilized white finish makes it suitable for indoor and outdoor use, while the waterproof vinyl seat cushion, padded with fire-retardant foam, detaches for effortless upkeep. Holds up to 264 lbs. Rated 4 out of 5 stars.4 total votes. This innovative, contoured chair provides external postural and lumbar support. It helps maintain the natural curves of the spine and serves to offset muscle fatigue that can lead to slouching. Coordinates with Angeles baseline tables. Rated 4 out of 5 stars.13 total votes. Whether they’re doing arts and crafts or settling down for a home-cooked meal, your little ones need a place to sit. And with its kid-safe rounded corners and playful, contemporary design, this chair is a fine fit! Founded atop four metal legs, the seat is crafted from solid and manufactured wood, featuring a curved silhouette for comfort. Plus, it's stackable, so you can easily redecorate your tyke's play area or bedroom. Rated 4 out of 5 stars.117 total votes. At just 26.25'' H x 14'' W x 13'' D, this pint-sized chair is the perfect pick for your little kiddo. Crafted from metal, its base features four angled legs with a metallic finish for a contemporary appearance. The eye-catching curved seat up top is modern, while a solid hue keeps it understated. Just pull it up to a table and you've got a fun spot for coloring and crafts. Arrives in a set of two. Rated 4 out of 5 stars.9 total votes. A fun and funky twist on a midcentury modern design, this set of four one-piece kids desk chairs is an excellent addition to any play room or homework station. Measuring 22.5’’ H x 15’’ W x 15’’ D, this chair is made from modified and batch-dyed polypropylene, making it water-, fade-, scratch-, and stain-resistant for effortless upkeep and easy cleaning. Stackable by design for convenient storage, this lively design is available in a variety of curated colors to suit your style. Rated 3 out of 5 stars.25 total votes. Inspired by an iconic mid-century modern design, this kids chair is as practical as it is stylish! Crafted of transparent polycarbonate, this chair features a medallion backrest, a gently contoured seat, and four curvy legs, while non-marking foot pads save your floors from scuffs and scratches. Measuring 25" H x 11.8" W x 13.4" D, this seat has a 12.4" seat height – perfect for kids aged 2 to 6. Plus, it’s stackable for space-saving storage. Constructed from solid wood and with extra solid hardware, Max & Lily’s Wood Kids Chair does not contain pressed cardboard or other inferior materials. The result is excellent quality that lasts. Max & Lily’s Chair features long-lasting, easy to clean, certified low-VOC paints and stains. Rated 4 out of 5 stars.10 total votes. Rated 3 out of 5 stars.5 total votes. 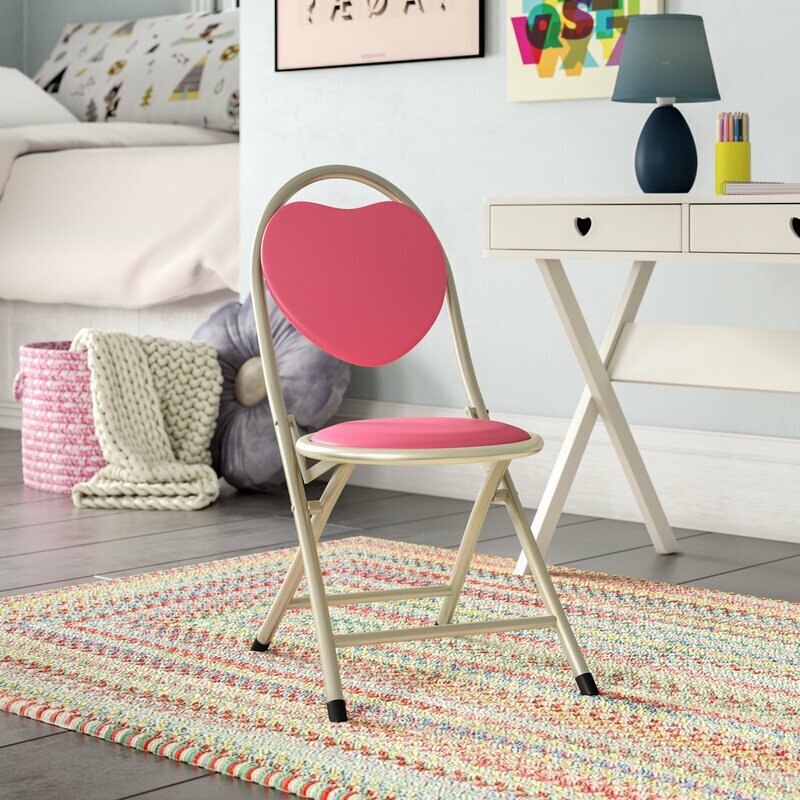 At just 22'' H x 14'' W x 12'' D, this pint-sized chair is the perfect pick for your little kiddo. Crafted from metal, its base features four angled legs with a metallic finish for a contemporary appearance. The eye-catching curved seat up top is modern, while a solid hue keeps it understated. Just pull it up to a table and you've got a fun spot for coloring and crafts. Arrives in a set of two. Rated 4 out of 5 stars.26 total votes. Whether this chair is for the kids or for you, it is the perfect addition to any desk or table.